In Roman times the safely navigable waters and firm banks of this reach of the Thames attracted large volumes of traffic by sea and land. This trade enabled London to become, and remain, the chief town of Britain. 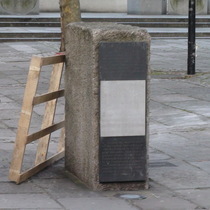 By displaying here profiles of the earlier known bridges which crossed to the City near this point, together with granite stones from Rennie's London Bridge of 1831 donated by the Corporation of London this monument commemorates the origin of London around this early crossing of the Thames. We thank Tom Long for the information about the crest.